Welcome to Session 6 of 7 in your FREE eCourse, Beginner’s B.O.O.S.T.S. To Getting Found Online, valued at $97. Session 5 identified some specific action steps you can take boost your online presence through social networking. Session 6 reveals why you want to tame time with automation, systemisation and education. What you can automate or systematise. How to tame time with education. 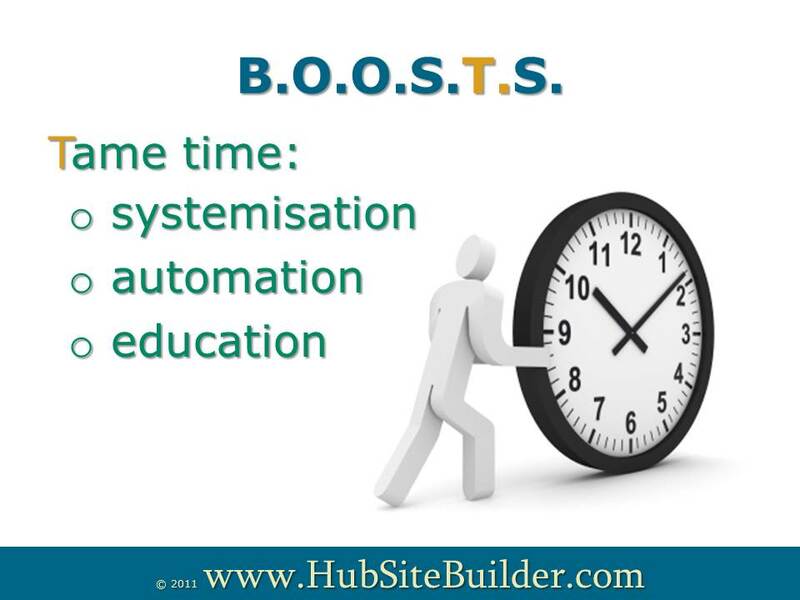 Tools to boost your online automation, systemisation & education. Link your blog posts to your email auto-responder so that your subscribers are automatically emailed whenever you make a blog post. Link your email auto-responder to your Facebook and Twitter pages so they are automatically updated whenever you make a blog post. Make it easy for your blog readers to share your posts by auto adding social share buttons to every post you make. It has been said that a smart person learns from his mistakes, but A REALLY WISE person avoids those mistakes by learning from the mistakes of others! Therefore, seek out the best educators you can find. That’s why I specialise in offering training to Baby Boomers who want to get their business online – I’ve made every mistake you could imagine, wasting time, energy and money in the process. My background in education and training allows me to break down into bite sized steps, without technical jargon, what you want to do to get your business found online. Why you want to stay in touch with your website visitors. What you can do to make ongoing communication easy. How to make the most of email auto-responder features. Specific tools to support your email automation success.